Shortly after dawn the shaggy New Forest ponies shuffle around in the low mist with the cows on the meadow as the sun slowly starts to heat the day. Among the trees the birds are vocally excited by the new day and there is warmth and shelter enough to keep the moisture at bay. The woodland floor still bares a carpet of fallen leaves but unlike a full Beech wood, the predominant mixture of Oak, Beech and Birch allows the sun good opportunity to penetrate and there are patches of Violets and Clovers here and there. Easy to miss, there is also the odd Bluebell, each bearing only two or three flowers, single introductory notes that precede the glorious blue overture to come. Drifting deeper into the woods the dawn chorus intensifies, the choir only just concealed by the sparse new leaves. Leaves of that perfect, bright green that epitomises the English spring. One song in particular cuts through the chitter chatter; more call than song, it encapsulates the spirit of woodland at this time of year. So clear and distinct, even and regular, it sounds almost artificial, a siren tempting unwary travellers off the paths and into the mysterious depths of the forest. Whilst the song is very familiar, I’m not able to identify it and after scouring the canopy in vein realise that the caller is moving further in to the woods, so I set off in pursuit. It’s not long before a small stream blocks my path. Although soon to face declassification to muddy ditch, I follow it’s bank to a makeshift bridge where several small boughs lumped together in their combined form offer a rickety but dry crossing. The going gets steeper as the land starts to rise and rattle of a Wood Pecker at work echoes a way off to my left. Ever a satisfying spot I’m tempted to divert but the continuing call ahead keeps me focused. I’m aware now that I’ve come a reasonable distance and start to consciously set landmarks, although trees among trees, there are always some characters that stand out as recognisable and the sight of a child’s part-built den fails to dispel the feeling of certainty that I am alone, or without human company, in the woods. With the climb and the brightening of the day the bird song has become far less intense and some moments go by without sound of my quarry. But when it returns it’s close, almost directly above me. A delicate little green and yellow bird that I’m certain is some kind of Warbler. At the very moment I make a positive sighting a second, completely different song, is added to the repertoire. This one is a descending line of notes that accelerate into an intense blur of sound and sends a shimmering dance through the little body, terminated and accentuated by a rapid flitting of the tail feathers. 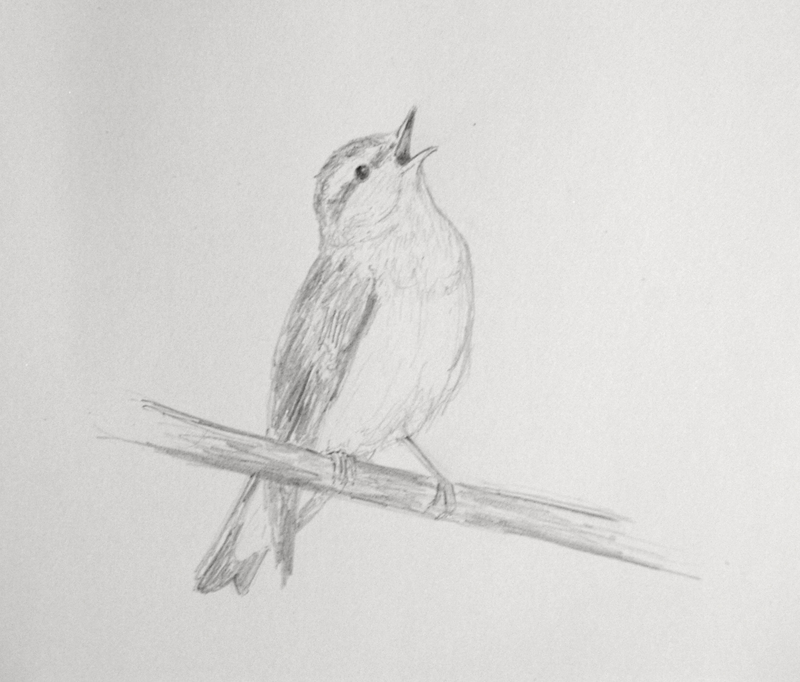 The song combination of the Wood Warbler. I watch on for a time as he switches between tunes, pausing occasionally to flit between favourite perches, before lowering my head to rest my neck and realise that I have no bearing as to which direction I came from. After a while I am the first to leave. Delighted with the encounter I wander down slope, happy to be in the wood, comfortable in it’s sanctuary and confident in it’s guidance. Even if it does inevitably deposit me slightly off course. I jump across the stream at a narrow spot, the lack of a crossing in the vicinity confirming that this is not exactly the route I took earlier. Suddenly I hear a shout. Children playing. In an instant there are other people in the world again and my link to the woods is unceremoniously seathered, no chance to say goodbye, they watch only silently watch on as I drift away out into the open. Wonderful. Well worth the walk and the writing. 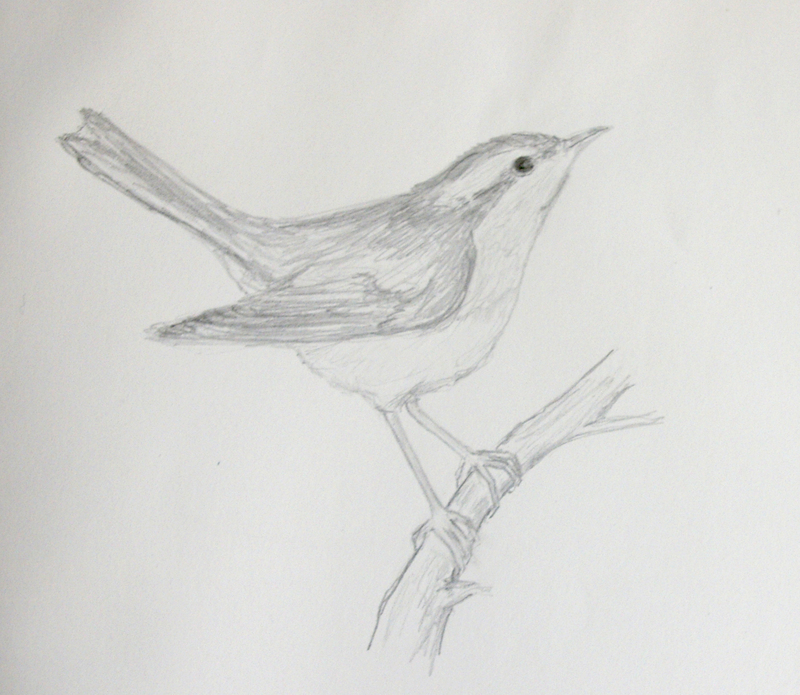 Your two sketches are excellent – birds being notoriously tricky to get life-like and right. You’ll have to do more of these bird forays….